Why do I Have Low Moisture in my Room? Home » FAQs » Why do I Have Low Moisture in my Room? Low moisture in a room is a byproduct of moisture escaping or equalizing with the humidity levels of other areas of your home or from outside. Increasing ventilation in your home and using a humidifier will raise the moisture levels in a room and throughout your home. A balanced ventilation system pulls fresh air into a home and exhausts stale indoor air outside. They don’t exactly add moisture to the air, but they prevent moisture from escaping the air that is pulled into the home. They also recover lost energy when your heating and cooling system is operating, decreasing your energy bill. A balanced ventilation system that runs through ductwork delivers fresh air, including moisture from outside, directly to rooms that are too dry. Proper ventilation is essential to maintaining proper moisture levels inside a home. Installed on either the supply or return plenum of a forced air handling system, warm air is drawn in and passes through a water panel. Moisturized air is recirculated throughout your home using the HVAC system’s blower motor. These systems only operate when the HVAC system is running because they utilize the system’s motor. These humidifiers work similar to that of a bypass humidifier except they include a fan that blows air across the internal water panel for higher water evaporation. A fan-powered humidifier doesn’t require a bypass duct because of the built-in fan and can be installed in smaller spaces. These humidifiers can also run independent of the home’s heating and cooling system. 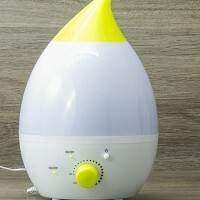 A steam humidifier adds moisture to the air by heating water until it boils and steam is formed. It works even when the furnace isn’t on, creating moisture indoors in the most efficient way possible. 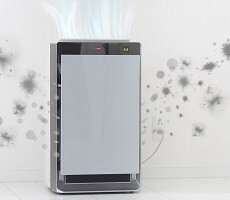 Steam humidifiers deliver a pure and natural form of moisture without compromising your indoor air quality or the energy efficiency of your current HVAC system.